*This material is discussed in the Appendix to the Chapter. associated with issuing long-term debt. Identify various types of bond issues. for bonds at date of issuance. 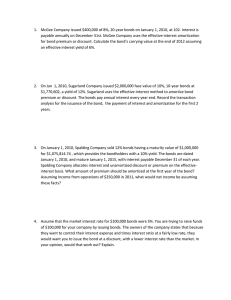 Determine proper amounts in account balances. Entries and questions for bond transactions. Information related to various bond issues. 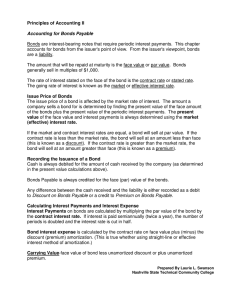 Entry for retirement of bond; bond issue costs. Entries for retirement and issuance of bonds. Imputation of interest with right. Term modification without gain—debtor’s entries. Term modification without gain—creditor’s entries. Term modification with gain—debtor’s entries. Term modification with gain—creditor’s entries. Debtor/creditor entries for settlement of troubled debt. Debtor/creditor entries for modification of troubled debt. 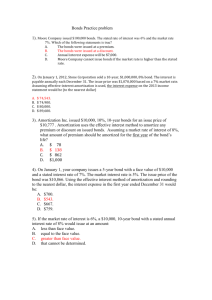 Analysis of amortization schedule and interest entries. Issuance and retirement of bonds. Entries for life cycle of bonds. Debtor/creditor entries for continuation of troubled debt. Restructure of note under different circumstances. Various long-term liability conceptual issues. Bond theory: price, presentation, and retirement. 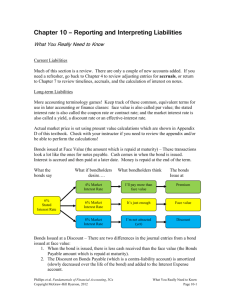 Bond theory: amortization and gain or loss recognition. signing of long-term notes and mortgages. a formal promissory note and becomes effective only upon default of the note. the par value; it is synonymous with the stated rate. (c) Stated rate—synonymous with nominal rate. (d) Market rate—synonymous with yield rate and effective rate. (e) Effective rate—synonymous with market rate and yield rate. investors can alter the effective rate of interest. Maturity value—the face value of the bonds; the amount which is payable upon maturity. Face value—synonymous with par value and maturity value. Market value—the amount realizable upon sale. Par value—synonymous with maturity and face value. interest below the stated rate. deduction from (addition to) the face amount of the bond. Both are liability valuation accounts. dollar amount of interest and an increasing or decreasing rate of interest over the life of the bonds. a constant rate of interest over the life of the bonds. bonds are issued or a reduction of the related debt liability. 10. Treasury bonds should be shown on the balance sheet as a deduction from the bonds payable. calling some or all of them, or by purchasing bonds on the open market and then retiring them. make sure any corresponding discount or premium is properly amortized. 13. Gains or losses from extinguishment of debt should be aggregated and reported in income. it is practicable to identify the sources. 2. The income tax effect in the period of extinguishment. 3. The per share amount of the aggregate gain or loss net of related tax effect. the market value of the note, whichever is more clearly determinable. market value of the note (whichever is more clearly determinable). up or down and in the total change that can be made in the rate. obtained more readily and at less cost. 2. Loan covenants are less likely to be violated. reporting the liability for the lease payments. rendered by the debtor, which is usually the owner of a manufacturing or transportation facility. *23. Two different types of situations result with troubled debt: (1) Impairments, and (2) Restructurings. bankruptcy in order to ensure the highest possible collection on the loan. a modification of items resulted. assets differs from their carrying amount (book value). more likely way to maximize recovery of the investment. 1. Reduce the face amount of the debt. 2. Accept noncash assets or equity interests in lieu of cash in settlement. 3. Reduce the stated interest rate. 4. Extend the maturity date of the face amount of the debt. 5. Reduce or defer any accrued interest. *27. When a loan is restructured, the creditor should calculate the loss due to restructuring by subtracting the present value of the restructured cash flows from the carrying value of the loan. Interest revenue is calculated at the original effective rate applied towards the new carrying value. of the scope of FASB Statement No. 114 would further delay its issuance. continue to be reported as long-term. Current liability if current assets are used to satisfy the debt. Current liability, $200,000; long-term liability, $800,000. have been made for refinancing. 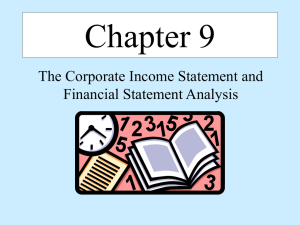 losses on the income statement. remainder as long-term liability on balance sheet. Debenture bonds—Classify as long-term liability on balance sheet. Notes payable—Classify as long-term liability on balance sheet. Payable for $5,000 and a debit to Bond Interest Expense for $1,000. *$28,836.80 = ($2,000,000 – $1,855,816) ÷ 5. *$222,697.92 = $1,855,816 X .12.
deferred charge in the Other Assets section on the balance sheet. January 1 to June 30, 2009 from (a) 3. July 1 to December 31, 2009 from (a) 4.
interest expense under the effective-interest method. $190,000 – ($390,000 – $221,000) = $21,000. ($200,000 + $18,000) – $190,000 = $28,000. accordance with APB Opinion No. 30 and SFAS No. 145. $1,600,000 X 10% = $160,000. $2,000,000 X 1.4276% = $28,552. $160,000 – $28,552 = $131,448. Adjusts $1 due to rounding. $1,600,000 X .71178 = $1,138,848. $160,000 X 2.40183 = $384,293. $1,523,141 X 12% = $182,777. $182,777 – $160,000 = $22,777. Yes. Bradtke Company can record a gain under this term modification. Therefore, the gain = $2,000,000 – $1,690,000 = $310,000. principal balance and no interest expense is recognized. $1,300,000 X 10% = $130,000. $1,690,000 – $130,000 = $1,560,000. $1,237,552 X 12% = $148,506. $148,506 – $130,000 = $18,506. recognized and no interest is recorded by the debtor. schedule has to be prepared. applicable), and the retirement of part of the bonds. and amortization, and the retirement of part of the bonds. are required for each of these transactions. constructed to support the respective entries. 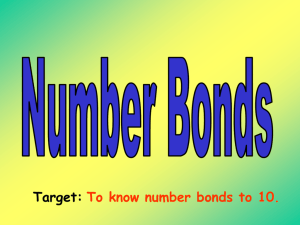 Purpose—to provide the student with an understanding of a number of areas related to bonds. accrued interest, and disclosure requirements of FASB No. 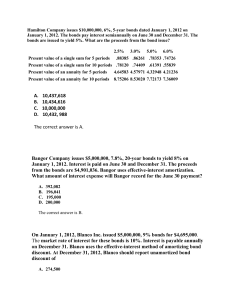 47.
debtor and the creditor and an analysis of the loss on impairment. 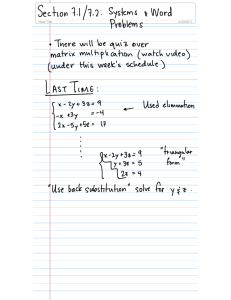 losses or gains must be computed and journal entries recorded on the books of the creditor. maturity value of $100,000 in 2009.
the life of the bonds. The loss is reported as an ordinary loss under SFAS No. 145.
than at the beginning of the year. it’s worth. One should question the ethics of a dealer using this tactic. (b) The loss is reported as an ordinary loss under SFAS No. 145. December 18, 2007 and due in 2027. *$1.80 adjustment due to rounding. The reacquisition price: 100,000 shares X $31 = $3,100,000. *2.03 adjustment due to rounding. *$77,313.01 = $99,363.90 + $7,949.11 – $30,000.00. **$0.12 adjustment due to rounding. equipment, none of the bonds are classified as debenture bonds. when interest expense is recorded for the period. rate of interest, and its premium. which gives you the actual interest expense. Subtract the amount calculated in #2 above from that found in #1. 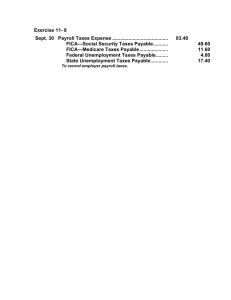 This is the amount to be amortized for the period. carrying amount for the following period. amortization in the next period. and discounts over the life of a bond. *$816,700 X 8% = $65,336. **$816,700 + $65,336 = $882,036. interest) according to the contractual terms of the loan. 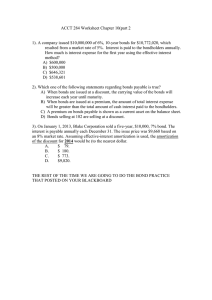 See amortization schedule from answer (b) above. $800,000 X .79383 = $635,064. It is a troubled debt restructuring. Hillary Inc.: No entry necessary. flows. However, Statement No. 114 did not amend debtor accounting. benefits derived by the debtor as a result of the restructuring. $121,000. Total future cash flow, $100,000 + ($100,000 X .10 X 3) = $130,000. gain is recognized at the date of restructure. per year) for three years to equal $121,000. Therefore, the approximate effective rate is 2 5/8%. **Adjusted $14 due to rounding. $100,000. The $1 difference is due to rounding. $10,000 = $100,000 X 10%. $100,000 = $100,000 – $0. arising from a bond issue. the treatment accorded these accounts in relation to the specifics of this case. between the effective-interest method of amortization and the straight-line method of amortization. treatment for a project financing arrangement. obligations discounted at the initial effective rate of interest. the passage of time. The emphasis upon premiums and discounts is eliminated. upon the interest rate that they are willing to accept on their investment(s) in this security. the present value of the future cash flows discounted at the rate of interest that they will accept. months from July 1, 2008 through January 1, 2028 and $1,000,000 on January 1, 2028.
payments discounted at an annual rate of 13% compounded semiannually. would sell for less than the maturity value. accepting it as the appropriate discount rate. at maturity. Thus, the effective-interest rate is objectively determined and verifiable. to historical cost. Also, this yield rate is objectively determined in an exchange transaction. is too high or too low in terms of the changes which may have taken place in the interest rate. valuation date), the liabilities would decrease. Thus, holding gains and losses could be determined. under this method would equal the total interest expense using the yield rate at issue date. has a real liability which affects financial condition and must be shown. value. Discount on bonds payable is not an asset because it does not provide any future economic benefit. The discount represents the market’s adjustment in the interest or yield element. received payment, the company still has a liability. a deduction from bonds payable. of the series of future semiannual interest payments. bond issue costs as either an expense or a reduction of the related debt liability. that is, the period from the date of sale (March 1, 2008) to the maturity date (March 1, 2013). justification for classifying the total bond issue costs as an expense. included in the determination of net income and classified as an ordinary loss. amortized as the difference between the par value of the debt and the proceeds from the issuance. effective-interest rate from which is subtracted the amount of cash interest paid. yield rates demanded in the marketplace. of the transaction and cost of obtaining the new debt instrument. life of the new instrument should be stated to reflect this decision. the debt is guaranteed by the companies that formed the new entity. the contracted products or services is not taken. Pitt should not record the plant as its asset. The plant is to be constructed and operated by ACC. right to the plant, nor the right to use the plant. about whether they should be recorded. believe that part of the debt does not have to be reported. related to variable interest entities. Roland Carlson, president, founder, and majority stockholder. stockholders (Jana Kingston and others). Doing what is right for the company and others versus doing what is best for oneself. Is what Roland wants to do legal? Is it unethical? Is Roland’s action brash and irresponsible? Jana Kingston gains control of Thebeau? this is a borderline case with no right answer. (1) Working capital = Current assets less current liabilities. P&G has a fairly weak liquidity position. The current ratio is below 1.
a larger interest expense charge in each year the bonds are outstanding. rate increased from 9.3% to 9.45%. A change in the Federal Reserve’s lending rate. A change in the bank prime rate. A flood of other similar securities issues. A good or poor earnings report for the issuer. A change in the issuer’s credit rating. affect the day-to-day sale of securities. recession and the lowering of interest rates. cash needs, or to leave a credit line available for quick access. was unattractive to Italian investors, so it sold at a discount. principal may not need to be paid in the foreseeable future. No journal entry is necessary to record the change in interest rate. considering the debt to total assets ratio of 52%. Lower interest rates may be available in foreign countries. Credit may be more readily available in foreign countries. the debt they are intended to modify. Answer will vary based on company selected. and there is uncertainty as to the value of its assets. increasing income, at a time when its prospects are quite dim. in a fair value hedge (see Appendix 17A). this Opinion is to refine the manner of applying existing accounting principles in this circumstance. Thus, it is not intended to create a new accounting principle. bonds, mortgage notes, equipment obligations, and some accounts receivable and payable. large and its term is relatively long. should be reported in the balance sheet as deferred charges. Difference due to rounding in tables. April 1. The bonds mature on April 1, 2015.
several notes payable. The long-term notes payable mature as follows.